This limeade recipe will transport you to a hammock surrounded by palm trees in the warm summer sun! Made with organic limes and just a pinch of all-natural agave, it's a delicious departure from the ordinary. 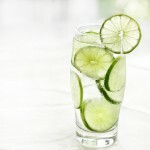 Citrus fruits help the liver to naturally detoxify, so go ahead.. indulge! Combine all ingredients in a pitcher and stir vigorously.